If you want to take the family for an adventure, the Monterey Bay Aquarium is one of the best aquariums in the world, and it provides hours of entertainment for people of all ages. Tickets are pricey, but there are ways to enjoy everything the aquarium has to offer without having to pay full price. Finding discounted aquarium tickets can be difficult. It is a popular destination, but there are ways to get in for less money. Besides discount tickets, signing up for a membership or for travel packages will bring you more discounts on aquarium tickets. AAA offers local members about $4 off per person, and you must purchase the tickets through them. The aquarium offers several discounts at its ticket booth. Children, seniors and students all get in for less than the general admission adult tickets. Children under the age of three get in free. Military personnel can purchase discounted tickets at various military locations around California plus one in Fallon, NV. Many corporations and credit unions offer discounted tickets through their organizations. You will need to purchase tickets through the human resources department or benefits department. Craigslist is a good option to try, since people often sell their aquarium tickets for as little as $10. If you think you'll want to explore the aquarium more than once over the course of a year or check out other Bay Area adventures, you might want to purchase a package or membership that will provide you with discounted admissions. CityPASS - With the purchase of CityPASS, you'll save almost half of the admission price to the aquarium. You will also get tickets to other Bay Area attractions and a week pass on public transit. It's a great deal for a family that likes to explore. Aquarium membership - The aquarium offers several membership packages to fit your budget. This is a great option if you plan to bring the entire family or visit more than once. Packages also may include guest passes. Hotel Packages - If you are staying in an area hotel, many of these establishments offer discounted aquarium tickets. Some local hotels and bed and breakfasts offer two-for-one rates. If you've never been to the aquarium before, here are a few of the exhibits that are responsible for making it so popular. Kelp Forest - This breathtaking exhibit puts you on the ocean floor as you look up at a forest of kelp. The twenty-eight foot high windows allow you to fully appreciate the magnitude of the kelp as you watch sea life like leopard sharks and wolf-eels swim amongst the foliage. This in one of the most unique aquarium exhibits in the world. Giant Octopus - The giant octopus is one of the most fascinating and mysterious animals in the sea. When you visit this exhibit, you'll have a chance to see these huge animals up close. At nearly thirty feet across and weighing almost one hundred pounds, the giant octopus is truly breathtaking. These creatures' ability to change color and blend in with their environment is an amazing activity to witness. Sea Otters - Sea otters are endearing and playful water mammals. The collection of otters at Monterey Bay Aquarium features a lot of pups that are endlessly entertaining. There is even a sea otter cam that you can visit to check in on the otters from your computer at home. Open Sea - The Open Sea exhibit highlights sea life from the open ocean. This exhibit hosts the largest collection of ocean animals in the world. Sea turtles and hammerhead sharks swim together with the largest collection of jellyfish in the United States. The Open Sea exhibit is truly breathtaking and not to be missed. 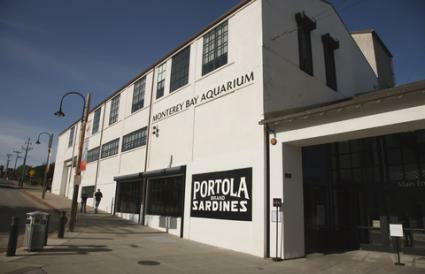 While adult tickets are about $35 a piece, you should be able to have an affordable and memorable trip to the Monterey Bay Aquarium by checking out the options above. In an area of the country rich with great attractions, the aquarium definitely stands out, so find a great deal and schedule your trip. You'll be glad you did.